Marvel fans are already jonesing to see "Guardians of the Galaxy" later this year, and today we're making the wait even harder as we present our exclusive first look at Hasbro's accompanying action figure line via their special edition 2014 Toy Fair poster. 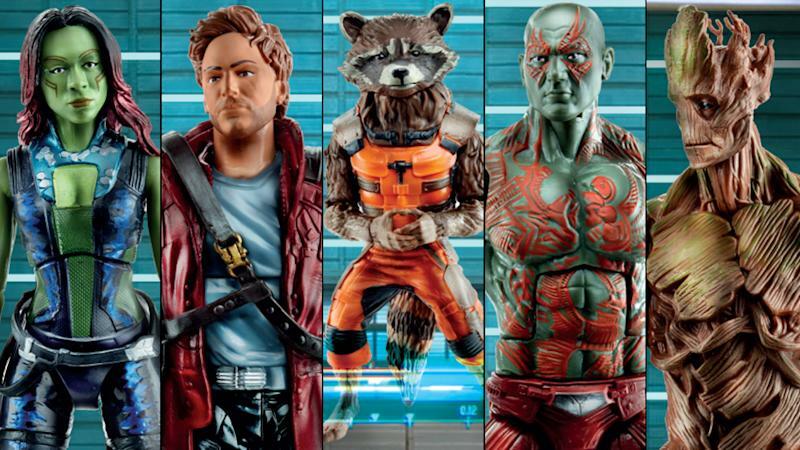 Hasbro's GOTG action figure line includes six figures total. In addition to those pictured above — Gamora (played by Zoe Saldana in the film), Peter Quill/Star Lord (Chris Pratt), Rocket Raccoon (Bradley Cooper), and Drax the Destroyer (Dave Bautista) — attendees will be the first to see the two remaining figures in the line when they're unveiled Saturday. And no, Groot (the tree-like creature voiced by Vin Diesel) doesn't count in this case because he's the Build-A-Figure character for the line; each figure comes with a build-a-figure piece that allows you to build your own Groot (and chop him down, if you see fit). So who's your favorite? Which figure most resembles its big screen counterpart? We're slightly partial to Rocket and the build-a-Groot, but that could change when we get our hands on the individual figures, which will hit shelves in July and retail for $19.99 each. 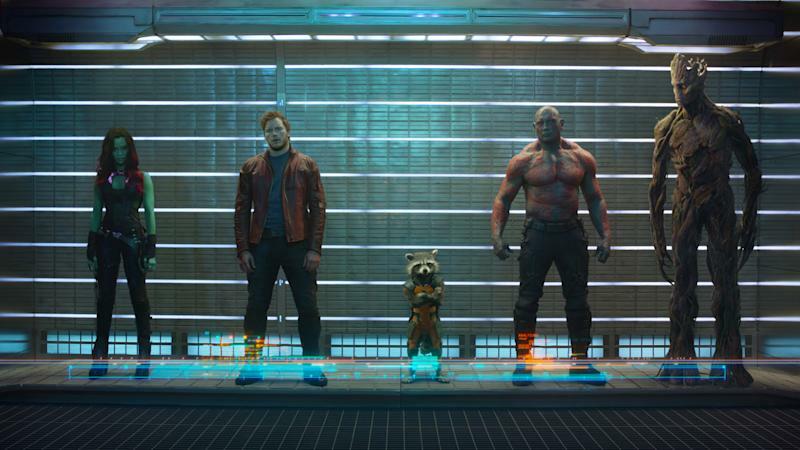 "Guardians of the Galaxy" opens in theaters August 1. Would you like to own this special edition Hasbro poster? Yahoo Movies is very lucky to have three posters to give away to three even luckier twitter followers. Note: One entry per person/email address/Twitter handle. Step 3: The giveaway ends 11:59 p.m. PT on February 21, 2014. Winners will be notified on Twitter and will receive a Direct Message with further information. Keep in mind, this giveaway is open to U.S. residents only. Official Rules: Yahoo! 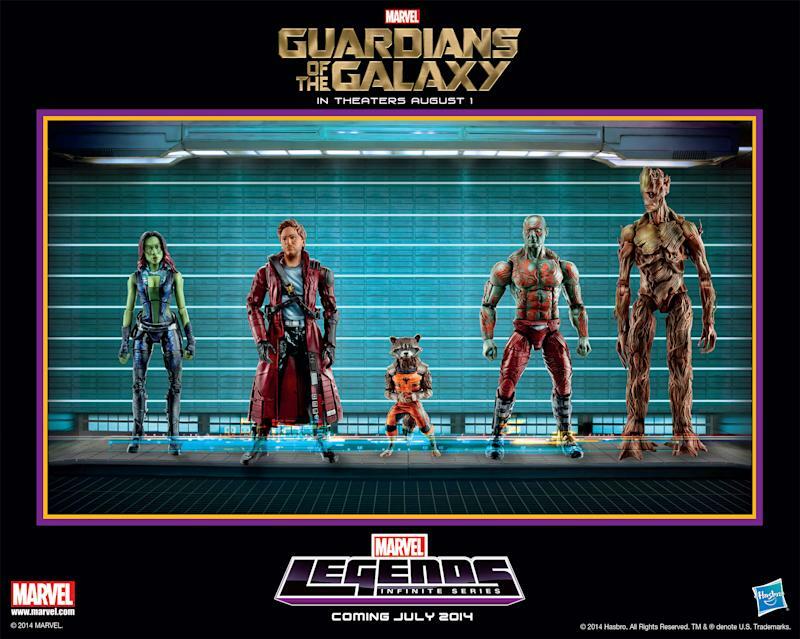 Movies Giveaway: 'Guardians of the Galaxy' Hasbro Poster THE FOLLOWING PROMOTION (THE "PROMOTION") IS INTENDED FOR PLAY IN THE FIFTY UNITED STATES AND THE DISTRICT OF COLUMBIA ONLY (COLLECTIVELY, THE "ELIGIBILITY AREA") AND SHALL ONLY BE CONSTRUED AND EVALUATED ACCORDING TO UNITED STATES LAW. DO NOT ENTER THIS PROMOTION IF YOU ARE NOT LOCATED IN, AND A LEGAL RESIDENT OF, THE ELIGIBILITY AREA. NO PURCHASE IS NECESSARY TO ENTER OR WIN. A PURCHASE DOES NOT IMPROVE YOUR CHANCE OF WINNING. ENTRY IN THIS PROMOTION CONSTITUTES YOUR ACCEPTANCE OF THESE OFFICIAL RULES. 1. Eligibility: You must be a legal resident of the Eligibility Area and 13 years or older at the time of entry. Void in overseas U.S. territories, possessions, commonwealths and military installations, and where prohibited by law. Employees and agents of Yahoo!, ("Sponsor"), Twitter, Inc. ("Twitter"), their respective affiliates, subsidiaries, advertising and promotional agencies, any other prize sponsor, and any entity involved in the development, production, implementation, administration or fulfillment of the Promotion (all of the foregoing, together with Yahoo!, collectively referred to as "Promotion Entities"), and the immediate family members and persons living in the same household as such individuals, whether related or not, are not eligible to participate or win. Twitter is not a sponsor of, or is in any way affiliated with, this Promotion. 2. How To Enter: a. Registration: The "Promotion Period" is defined as the period specified in the Yahoo! Movies blog for each promotion. If you are not an existing Twitter account holder, visit twitter.com and follow the instructions to register for a free Twitter account. Once logged into Twitter, set your Twitter account to "follow" the Twitter handle associated with the Promotion, @YahooMovies (the "Promotion Twitter Address"). You MUST "follow" the Promotion Twitter Address during the entire Promotion Period to be eligible to win. b. Entry: Once you have registered for the Promotion, complete your entry in the Promotion by either i. Mail Entry: Send a printed copy of this web page along with your name and contact information to: Yahoo! Movies Promotion Entry, Yahoo! Inc., 2400 Broadway, First Floor, Santa Monica, CA 90404. Include the name of the Promotion you are entering with your entry. Entries post marked after the close of the Promotion Period will not be honored. ii. Twitter Entry: Send a Twitter update (a "Tweet"), using the Twitter account you set up in Rule 2a above, to @yahoomovies with the words "Blam! I want to win an exclusive @Hasbronews #GOTG poster from @yahoomovies: http://yhoo.it/GOTG #YGiveaway" iii. You will receive ONE entry in the Promotion (an "Entry"), when you submit a Tweet to @yahoomovies during the Promotion Period, in accordance with the method described above. For purposes of these Official Rules, "receipt" of an Entry occurs when Yahoo! receives your registration and entry information as properly submitted by you in accordance with the instructions above. In the event of a dispute regarding the identity of the holder of a Twitter account or handle, the dispute will be resolved in favor of the individual who is the "authorized email account holder" of the "alternate email address" provided when the Twitter account was created. "Authorized email account holder" is defined as the natural person assigned an email address by an internet access provider, online service provider, or other organization (i.e., business, educational institution) responsible for assigning email addresses for the domain associated with the submitted email address. If Yahoo! is unable to verify the authorized account holder of a potentially winning Twitter account, that account will be disqualified and an alternate winner selected. A potential prize winner may be required to provide Promotion Entities with proof that he/she is the authorized account holder as described above. LIMIT ONE ENTRY PER PERSON, PER EMAIL ADDRESS AND/OR PER TWITTER ID. Although subsequent attempts to enter may be received, only the first entry received from a particular individual will count; subsequent attempts to enter will be disqualified. The submission of an entry is solely the responsibility of the entrant. Entries may only be made according to the method described above. Proof of sending (such as an automated computer receipt, "thanks for entering" message, or post office receipt) does not constitute proof of actual receipt by Yahoo! of an entry for purposes of these Official Rules. Automated entries (including but not limited to entries submitted using any bot, script, macro, or sweepstakes service), copies, third party entries, facsimiles and/or mechanical reproductions are not permitted and will be disqualified. Only eligible entries actually received by Yahoo! before the end of the specified entry period will be included in the prize drawing. Unintelligible, incomplete, or garbled entries will be disqualified. All entries become the property of Yahoo!, and none will be acknowledged or returned. 3. Conduct: By entering the Promotion, entrants agree to comply with and be bound by these Official Rules. The Official Rules will be posted at http://movies.yahoo.com/blog throughout the Promotion. Failure to comply with these Official Rules may result in disqualification from the Promotion. Entrants further agree to comply with and be bound by the decisions of the judges, which will be final and binding in all respects. Yahoo! reserves the right at its sole discretion to disqualify any individual it finds to be: (a) tampering or attempting to tamper with the entry process or the operation of the Promotion or any Yahoo! or Promotion-related website; (b) violating the Official Rules; (c) violating the terms of service, conditions of use and/or general rules or guidelines of any Yahoo! or Promotion related property or service; or (d) acting in an unsportsmanlike or disruptive manner, or with intent to annoy, abuse, threaten or harass any other person. CAUTION: ANY ATTEMPT BY AN ENTRANT OR ANY OTHER INDIVIDUAL TO DELIBERATELY DAMAGE ANY WEBSITE OR UNDERMINE THE LEGITIMATE OPERATION OF THE PROMOTION MAY BE A VIOLATION OF CRIMINAL AND CIVIL LAWS. SHOULD SUCH AN ATTEMPT BE MADE, YAHOO! RESERVES THE RIGHT TO SEEK DAMAGES FROM ANY SUCH PERSON TO THE FULLEST EXTENT PERMITTED BY LAW. 4. Prizes: Grand Prize: Three grand prize winners will each receive one limited edition Hasbro Guardians of the Galaxy 2014 Toy Fair poster. There is no retail value of the prize, since it's not for sale. Limit one prize per winner. Prizes cannot be used in conjunction with any other promotion or offer. Prizes may not be transferred or assigned except by Sponsor. Only listed prizes will be awarded and no substitutions, cash equivalents or redemptions will be made, except that Sponsor reserves the right to substitute any prize package with another prize of equal or greater value in the event that an advertised prize (or any component thereof) is not available. Expenses not specifically stated above, together with the reporting and payment of all applicable taxes, fees, and/or surcharges, if any, arising out of, or resulting from, acceptance or use of a prize, are the sole responsibility of the winner of that prize. Yahoo! expressly disclaims any responsibility or liability for injury or loss to any person or property relating to the delivery and/or subsequent use of the prizes awarded. Yahoo! makes no representations or warranties concerning the appearance, safety, or performance of any prize awarded. Restrictions, conditions, and limitations apply. Promotion Entities will not replace any lost or stolen prize items. 5. Winner Selection and Notification: Potential winners will be selected in a random drawing to be held within three (3) days following the close of the Promotion Period for each Promotion from among all eligible entries received. Odds of winning depend on the number of eligible entries received. All prize drawings will be conducted by a representative of the Sponsor, whose decisions are final. Potential winners will be notified within seven days after drawing date. Prize notifications will be delivered by a Twitter update from Yahoo!. Return of any prize/prize notification as undeliverable, or inability of Promotion Entities to contact a potential winner within 48 hours following attempted notification may result in disqualification and selection of an alternate winner by random drawing. Any difference between actual value of a prize and the approximated value of a prize as stated in these Official Rules will not be awarded. 6. General Conditions: This Promotion is governed by the laws of the United States. All federal, state and local laws and regulations apply. By entering, participants: (a) release and hold harmless Promotion Entities, and their respective parents, subsidiaries, affiliates, directors, officers, employees, and agents from any and all liability for any injuries, loss or damage of any kind to persons, including death, or property damage resulting in whole or in part, directly or indirectly, from acceptance, possession, misuse or use of any prize, participation in this promotion, or while traveling to, preparing for, or participating in any prize-related activity, and (b) grant to Yahoo! the right to use and publish their proper name and state online and in print, or any other media, in connection with the Promotion. Except where prohibited by law, a winner's acceptance of a prize constitutes permission for Promotion Entities to use such winner's name, address (city and state only), statements, photograph, voice and/or likeness for any advertising and promotional purposes relating to the Promotion without further compensation, consideration, review or consent. 7. Limitations of Liability: Promotion Entities assume no responsibility for lost, late, misdirected, garbled or unintelligible entries or Tweets, or for theft, destruction or unauthorized access to, or alteration of, entries. Promotion Entities are not responsible for any incorrect or inaccurate information, whether caused by website users, any of the equipment or programming associated with or utilized in the Promotion, or any technical or human error which may occur in the processing of submissions in the Promotion. Promotion Entities assume no responsibility for any error, omission, interruption, deletion, defect, delay in operation or transmission, failures or technical malfunction of any telephone network or lines, computer online systems, servers, providers, computer equipment, software, email, players or browsers, whether on account of technical problems, traffic congestion on the Internet or at any website, or on account of any combination of the foregoing. Promotion Entities are not responsible for any injury or damage to participants or to any computer related to or resulting from participating or downloading materials in this Promotion. If, for any reason, the Promotion is not capable of running as planned, including infection by computer virus, bugs, tampering, unauthorized intervention, fraud, technical failures, or any other causes beyond the control of Promotion Entities which corrupt or affect the administration, security, fairness, integrity or proper conduct of this Promotion, Yahoo! reserves the right at its sole discretion to cancel, terminate, modify or suspend the Promotion and select winners from among all eligible entries received prior to the cancellation. 9. Winners List: The names of the prize winners may be obtained for 90 days following the close of each Promotion Period by sending a self-addressed stamped envelope to: Yahoo! Movies Promotion, Winners List Requests, Yahoo! Inc., 2400 Broadway, 1st Floor, Santa Monica, CA, 90404.Please include the name of the Promotion for which you are requesting the winners' list. 10. Sponsor: Yahoo! Inc., 701 First Avenue, Sunnyvale, CA 94089. Twitter, Inc. is not a sponsor of this Sweepstakes.